Canine sports medicine is a rapidly growing field within veterinary medicine that deals with the diagnosis, treatment, and maintenance of canine athletes and working dogs. It includes a “whole body” approach to assess and address issues with specific body systems; e.g. respiratory, cardiac, endocrine, and especially musculoskeletal that may impact performance. 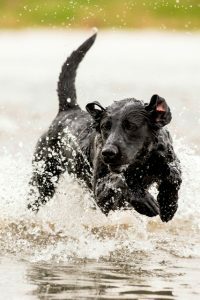 Musculoskeletal injuries are the most common cause of poor performance or the inability for the dog to compete or work. Sports medicine orthopedic evaluations following injury will involve lameness evaluation, diagnosing the site of injury whether it be joint or soft tissue, developing a treatment plan, and ultimately planning a dog’s return to sport or work after an injury or surgery. Expectations for your dog are always carefully evaluated and so that we can help them return to, and excel in, their sport or job. Prevention of injury and disease in critically important for the canine athlete and working dog and they must remain in peak health and fitness to remain on the job successfully. Routine sports medicine “whole body” exams help identify any issues in the early stages so that strategies can be developed to ward off future or chronic issues. Florida Veterinary Rehabilitation and Sports Medicine recommend biannual Sports Medicine Evaluations to assess your dog’s overall health. Athletic dogs can suffer a variety of injuries that can not only affect their performance but their long-term health and welfare. Working with a sports medicine specialist will help to maximize your dog’s recovery from injury, but they also can work on injury prevention strategies. In addition, rehabilitation therapies can also help keep your dog at peak performance by addressing any mild issues that may mean the difference in your attaining your competition or working goals.